Whether you’re upgrading your bike for better performance, replacing worn-out parts or you just want to personalise it to your own taste, choosing the right parts can be a bit of a minefield. Take a look at the ways you can upgrade your bike. There are lots of reasons to upgrade the parts fitted to your bike. If you’re a competitive rider, fitting more competitive and high performance parts will see your race times tumble. If you’re a commuter, you might want more reliable gears and brakes or tyres with better puncture resistance. Even if you simply enjoy a leisurely canal path ride at the weekends, upgrading your bike to be more comfortable and stylish may be your goal. Upgrading your bike doesn’t have to be a bank-breaking experience either. We offer 0% Finance on all orders over £250. Arguably the most noticeable improvement you can make to any bike is to replace the wheels with lighter ones which are more aerodynamic. There’s more to this than just making the complete bike a bit lighter, which has far-reaching benefits in itself. When you’re pedalling a bike, your effort doesn’t just go into propelling yourself forwards, you have to accelerate the weight of the wheel as well, and you’d be surprised how much energy is used in doing that. You can liken your spinning bike wheels to a figure skater. In the video below, the skater begins to spin, slowly at first, but as soon as she brings her arms and legs towards her body, she speeds up tremendously. She isn’t getting any heavier or lighter, she’s just concentrating her weight more towards her centre. By fitting bike wheels with lighter rims, the centre of gravity of the wheel is closer to the hub, so the wheel accelerates more easily. When you also consider that high performance wheels may have hubs with ceramic bearings, bladed spokes and deep-section aerodynamic rims, the benefits really begin to add up. Wheel upgrades are particularly noticeable on road bikes, where wheel speeds are higher and a few grams represents a much bigger portion of the overall wheel weight. However, the same benefits apply to all bike wheels, regardless of their size. On mountain bikes, the width of the wheel rim itself can have a pronounced effect on the bike’s performance by changing the shape of the tyre. Mountain bikes can also often be upgraded to run tubeless tyres, which both saves the added weight of an inner tube and lets you run lower air pressures without risking a puncture. 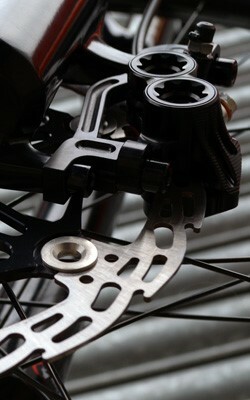 One of the biggest influences on the performance of your mountain bike is the suspension. Both your fork and rear shock directly control the way your wheel reacts to changes in the surface you’re cycling on, so the grip and comfort of your bike can be drastically altered with these components. Although the most basic suspension won’t have any damping at all, most aftermarket suspension forks and rear shocks will have oil damping systems to help control the wheel. Damping systems control the speed that the suspension is allowed to move, and prevents the fork or shock from bottoming out over every bump then bouncing back too quickly afterwards. Typically, an aftermarket fork or shock upgrade will at least give you the option to adjust the rebound damping, which as the name suggests, controls how fast the suspension rebounds after being compressed. To really make the most out of your bike, a fork or shock with adjustable compression and rebound damping gives you greater scope to fine tune your bike’s handling, keeping the tyre in contact with the ground as much as possible. You can even buy professional-level parts which give you lots of adjustment options, including high speed and low speed compression & rebound damping settings. When upgrading your suspension, you can choose between air or coil springs. Coil springs have what’s called a ‘linear spring rate’ whereas air springs have a ‘rising’ spring rate. To explain what that means, let’s say you have a 400 lb/inch coil spring on your rear shock. If you squeeze the spring with 400 lbs of force, it will compress 1 inch. If you squeeze is with 800 lbs of force, it will compress 2 inches. 1200lbs is 3 inches, and so on. At every point throughout the travel of the spring, the stiffness remains the same – add 400lb of force and the spring will compress 1 inch, thus the spring rate is ‘linear’. With an air spring, let’s say you have 100psi in the shock which gives an equivalent 400lb/in. When you compress it, the volume of air decreases so the pressure goes up and the spring gets harder. If you compress the shock 1/2 way so the volume of air is half the size it was to begin with, the pressure will double and the equivalent spring rate will double to 800lb/in. If you compress it to 1/4 its original length, the equivalent spring rate will be 1600lb/in. The more you compress it, the more the pressure ramps up and the harder the spring gets, and thus the spring rate is ‘rising’. A rising spring rate can be a big benefit on a mountain bike bikes. It allows you to have a soft spring rate to begin with, allowing the suspension to react quickly to small changes. Then it progressively gets harder towards the end of the wheel travel so that you don’t bottom out. Air springs are also lighter in weight than coil springs, which makes them a big favourite with racers and cross country riders. Coil springs are still popular on a lot of long-travel downhill bikes with soft suspension where you want to retain that quick reaction throughout the whole range of movement. We’ve all been there, cursing on the side of the road or trail because our chain has fallen off. High performance chainsets are not only better at resisting the dreaded dropping of a chain, but they are lighter and will change gear with greater speed and precision than entry level groupsets. 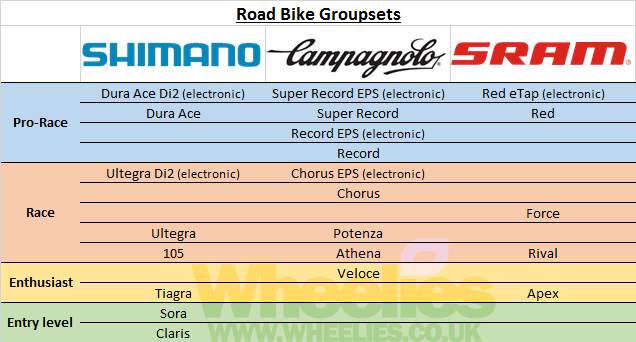 There is a lot to choose from when it comes to groupsets. 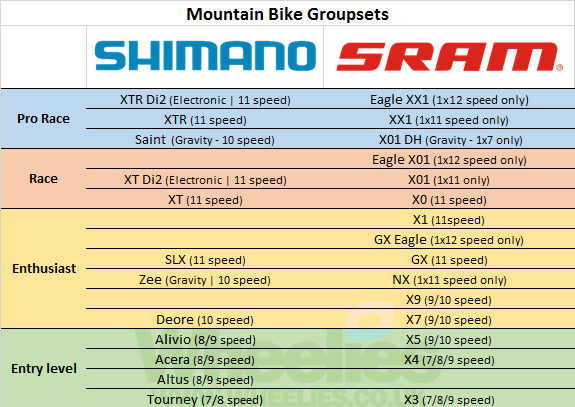 On mountain bikes, you can choose anything from 8 or 9 speed, right the way up to 10, 11 and 12 speed. You can even choose to run a triple, double or single front chainring. Read more about how many gears you need on a bike. On road bikes, you will typically be upgrading in the 9, 10 or 11 speed gear ranges, and you can choose from compact (50/34t), semi-compact (52/36t) and regular (53/39t) chainsets, which have different numbers of teeth on the chainrings (indicated by the numbers). It’s important to remember that upgrading your chainset or cassette alone own is generally not recommended, particularly if the parts are heavily worn. Your chain will ‘wear in’ to the shape of your chainrings, which will affect the way your cassette and rear derailleur wear a well. Replacing the chain on its own isn’t such an issue, as it will tend to follow the existing wear pattern already present on the rest of the drivetrain. Replacing your cassette or chainrings separately can prove problematic, particularly after they have covered a lot of miles, as the rest of the wear cycles fall out of sync with each other. This can be severe enough to cause chain slip / skipping and will prematurely wear the rest of the components in the drive train to the point where they must all be replaced anyway. If you want to go fast, you also need to slow fast. A good set of brakes will not only help you slow your bike down sooner (particularly during poor weather conditions), they also give you better control over the bike at the same time. A set of quality rim brake pads can make a huge difference to the power and performance of your rim brakes. A grippier compound, which is less prone to squishing under pressure, will give you more power and take out some of the spongy feeling from the brake lever. Likewise a lighter an stiffer set of brake calipers will do the same, giving you better feel (aka modulation) in the brake levers so you can brake closer to the limit of locking the wheel without losing traction. 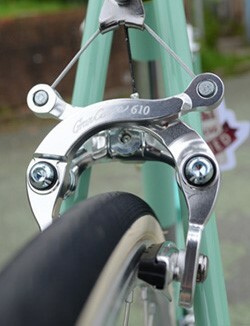 Often overlooked, it pays to invest in a good set of cables and housings for your rim brakes as well. If you’re fighting against friction between the cable and the housing whenever you pull the lever, your braking response will be slower, and ultimately, you’ll be having to work harder at the lever for the same braking power at the wheel. High grade brake cables are also more resistant to stretching than cheaper cables, which further improves the modulation you feel at the brake lever. If your bike doesn’t already have disc brakes, but does have the mounts needed to fit them, a set of hydraulic disc brakes will be one of the most noticeable improvements you can make to your bike. Disc brakes require much less movement at the pad compared to rim brakes, which immediately translates into a more direct feel and better modulation at the rake lever, whether you’re using cable or hydraulic operated calipers. Speaking of which, hydraulic brakes use an oil to operate the pistons in the brake caliper, whereas cable brakes pull a steel cable. Because the oil is incompressible, whereas steel cables can stretch, braking ‘feel’ and modulation is dramatically improved using a hydraulic disc brake, and the brake lever itself operates with much less friction. If you already have disc brakes on your bike and feel the need for a bit more power, you can often upgrade to larger disc rotors. Bigger disc rotors have greater leverage over the wheel, giving you more ultimate braking power. If you already have power and modulation that you’re happy with, but keep finding that your brakes fade as they get hot on long descents, Shimano’s Ice-Tech disc rotors use a blend of steel & aluminium to help improve heat dissipation, keeping the brakes cool and preventing a dangerous loss of power. Disc rotors are mainly available in 140mm & 160mm diameters to suit road bikes, and 160mm, 180mm and 203mm to suit mountain bikes. You don’t just have to upgrade parts to improve performance on your bike. You can change the way your bike looks, colour co-ordinate it, or just make it a little more comfortable. Upgrading parts like the grips, saddle, stem and handlebar can make your bike look more stylish, feel more comfortable and ride faster. Brooks England are renowned for their ‘quality first’ ethos, combining over 150 years of experienced saddle making with some of the most stylish and comfortable fine-leather saddle designs available – their history pre-dates pneumatic tyres, so they know a thing or two about saddle comfort. If you’re upgrading a lot of things on your bike in one go, the bill can begin to add up. At Wheelies we have a range of finance options available on all orders over £250, including 0% interest free finance and flexible deposits from £0. Check out our Bike Finance Calculator for more information.